In the spring of 2016 I was given the chance to purchase a 1974 Javelin. This Javelin was purchased by the current owner’s brother, back in 1974. Apparently, the original purchaser was indeed a 19-year-old kid that had a good job and decided he needed a new car. He narrowed his choices down to either the American Motors, Javelin or the Plymouth, Cuda. He eventually decided on the Javelin because "It had more style and he felt it was more car for the money". He went to Greenburg's AMC, in Anoka, Minnesota, to place an order for the car he wanted. He had made the decision to buy a white one with a gold stripe down the side. This is the same car that was shown in the 1974 AMC brochure. His best friend at the time, convinced him that the red one was much better looking. So he was persuaded, at the last minute, to order the Trans Am Red one. He drove his new `74 Javelin through the summer and had to buy a Plymouth Valliant as a beater for the winter. This car has never seen a Minnesota winter due to the original owner’s foresight. I purchased this car from the brother of the original purchaser in May of 2016. He had purchased the car from his brother in 2003. The original owner is 62 at this point. During the holidays, I was planning on making a Pinewood Derby car of this `74 Javelin. This car would be raced in our car club Pinewood Derby race in February of 2017. At the time, I decided I should make 3 cars, one for each of the owners of this very unique car. As things normally go in my world, this project kept getting larger. I thought it needed some sort of box to package the car in. I had a Javelin AMX snap together model, a green Johan snap together promo, box with a couple of parts left inside. I thought this would make an interesting box to hold the cars. The original plan was to get these model cars to the owners sometime around the holidays, but with these additions the timing seemed impossible. No one knew these were even in production so timing wasn't a huge deal. In early February, these cars were ready to go to the owners of this Javelin. Each of the boxes are numbered. The past owners love the cars, along with the display box. The top of the box tells the story of the car and ends with "Marty was able to build “his” model of the Javelin". That's some beautiful work. Not just once, but 3 times. That's very impressive. Nice job. Very nice job's on the cars Andy! Like the holding board tool you made to help hold the car while pushing the chisel. Looks handy! As I remember the setup for holding the car, while chiseling, was an idea I stole from Whoda. However if i had to carve out 3 cars using a chisel and an Xacto knife.. my free hand used to hold the work piece would be very tired by now! (plus put at risk of a slip cut or gash from the tool!) I'm not as young as I used to be.. So i thought id share how much i liked your holding jig tool idea. 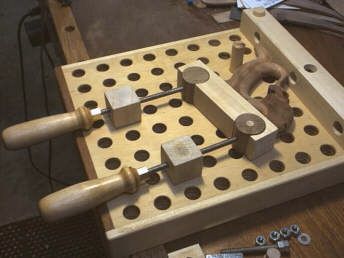 And just how handy it is for wood carvers to use a jig like that to aid and assist in the holding of the work piece while pushing and shaping with a chisel. And if I were to try out the wood chisel's for shaping a car with.. I would need a few more ways to clamp and hold the work piece down! maybe something with a clamping system like this one that i just ran across. I don't know how you do it Andy! However keep the car builds coming.. as i enjoy seeing the cars Noah & You build. Nice work, really like the boxes too... which no doubt leads to people looking at them on display thinking, oh look that guy cheated by using a model, LOL - gotta love those people. We had a father-son team build matching cars one year. They bought the same plastic model kits, but used them very differently. The dad basically just built the plastic model and fit it around his block of wood. The son used details from the plastic model, and carefully shaped his block so the plastic pieces fit perfectly. Apparently, the design judges assumed that the son had "just built a plastic model", because it was obvious that the father had done so, and it was obvious that the two cars were the same design.